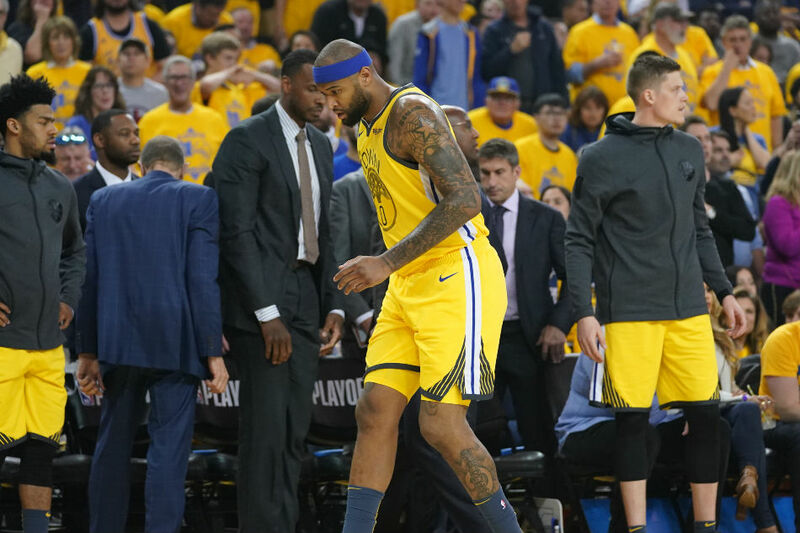 Golden State Warriors center DeMarcus Cousins suffered a non-contact injury to his left quad less than four minutes into Monday night's game and will not return, the team has announced. The Warriors also said via Twitter that Cousins will undergo an MRI exam "in the next 24 hours." Cousins was injured while trying to run down a loose ball 3 1/2 minutes into Game 2 of his team's first-round playoff series against the Los Angeles Clippers. The host Warriors had an 11-9 lead at the time and hold a 1-0 lead in the series. With the Clippers possessing the ball just past the half-court line, Cousins deflected a pass and sent it down the court toward the Warriors' bench. Trying to run down the ball before it went out of bounds, Cousins stumbled and went down without being touched, and immediately grabbed his left quad. He got up and soon limped off the court toward the Warriors' locker room. He had two points on a pair of free throws in four official minutes played. He also had two rebounds and an assist. Cousins, 28, had nine points, nine rebounds and four assists in Saturday night's Game 1, his first career playoff game. The Warriors won that game 121-104. Cousins signed a one-year, $5.3 million deal with the Warriors last offseason, then missed the team's first 45 games of the season as he continued to rehab from a ruptured left Achilles tendon he suffered playing for the New Orleans Pelicans on Jan. 26, 2018. Picked fifth overall in the 2010 draft, the nine-year veteran is a four-time All-Star with career averages of 21.2 points, 10.9 rebounds. 3.2 assists, 1.4 steals and 1.2 blocks per game.